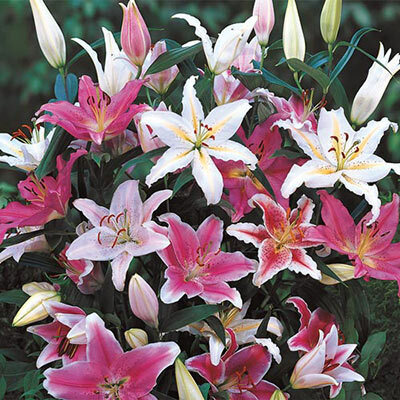 Oriental Lily Mixed lily bulbs are perfect for planting in the sunny garden borders. This delightful mix includes seven popular Oriental lily varieties and will add show-stopping summer color and fragrance to the garden as well as cut flower arrangements and bouquets. Florists favor Oriental lilies for summer bouquets and bridal centerpieces. Their fragrance permeates the garden air. These easy-to-grow lilies grow 3-4' tall and grow best in sun to partial shade. They bloom in midsummer, and butterflies love them! Leave the hardy bulbs in the ground year-round for increased beauty in following years. Bulb size: 14-16 cm.